Is the 10,000 hours principle true? And if it's true, what are your chances of success? And what are the biggest flaw? How do you take the concept of Malcolm Gladwell's 10,000 Hours story (He took it from a K.Anders Ericsson study) and reduce the number of hours? Is talent really attainable in fewer hours? Have you ever watched a 16-year-old go for a driving test? They probably practice for two or three off and on, and then after that, they drive. Now, imagine they changed the rules of the driving test. Imagine they said that you needed 10,000 hours to drive. How many of us would be on the roads today? Several years ago, best-selling author Malcolm Gladwell wrote a book called “Outliers”. Within that book, there was this concept of 10,000 hours, and the concept was very simple. It said that if you wanted to be exceedingly good at something, you needed to spend at least 10,000 hours. As you can quite quickly calculate, that’s about ten years of very had work or five years of extremely hard work. The interesting thing about the 10,000-hour principle is that two sets of people jump on it, the people that had already put in their 10,000 hours in something and those who hadn’t; but what if you hadn’t? What if you hadn’t put in those 10,000 hours? Were you doomed to be always untalented? Understanding this concept of the 10,000 hours is very important, especially if you want to take vacations. You have to get very skilled at a lot of things very quickly. If you don’t understand the concept, then you struggle for no reason at all. 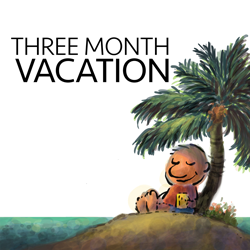 In today’s episode of the Three-Month Vacation, we’re going to cover three things. The first is, why is the 10,000 hours true? The second, what are the biggest flaws in the 10,000 hours? The third is, how do you go about shortening that process, so that you just do maybe a thousand hours? 1) Let’s start out with the concept of why the 10,000 hours is absolutely true. Now, nothing is absolutely true, but the 10,000-hour principle works for a simple reason. That is we don’t know that we’re making mistakes. If you take a guitarist, say someone like John Mayer, or Eric Clapton, or B.B. King, and you look at how long they spent with their guitar, they probably spent an excessive 10,000 hours. When you’re starting out and when you’re playing that guitar, you don’t really know what mistakes you’re making, and you don’t really care. You’re there just to play the guitar, and this is what a lot of artists do. This is what a lot of writers do. They spend enormous amounts of hours just fooling around, just playing the guitar, just drawing a cartoon, just writing something, and they make mistakes. They make a lot of mistakes, but the problem is they don’t know that they’re making a mistake. I said, “What’s wrong?” He couldn’t explain, but he said, “They’re really flat.” It was then I realised that I wasn’t using perspective. Until that moment, I didn’t realise. I’ve been drawing for hundreds, maybe thousands of hours, but I didn’t realise I was making a mistake. Several years later, I started doing commercial projects, and someone mentioned that my lines were too weak. Lines are too weak? What do you mean by lines are too weak? They couldn’t explain, but I had to do my own research. Most musicians, artists, painters, people who we call talented spend thousands of hours just making mistakes. If you take the mistakes out of the equation, we don’t have 10,000 hours. We have a thousand hours, maybe less. If you go strictly by the rulebook, you can fly a commercial aircraft after 1,500 hours. Now, admittedly, you’re not going to get a job after flying just 1,500 hours, but you can fly one of those big jets. This is true for cartooning as well. This is true for writing. It’s easy to say that it’s true, but the proof of the pudding is in the eating, so we decided to prove the point. We knew very few people could draw cartoons. People joined the course saying, “Well, I can’t draw a straight line.” The ironic thing is that to be a cartoonist, you don’t have to draw a straight line. It’s amazing because when you think about it, these were all business owners. They probably had an hour a day, five days a week. That makes it about 25 hours in a month. In 6 months, that’s 150 hours. Within just 150 hours, they changed the perception of someone looking at their work. Suddenly, to the outside world, these guys were cartoonists since they were little. It doesn’t take 150 hours to learn to drive a car, and that’s because there are fewer moving parts. There are moving parts with cartooning. You have to learn perspective, and thick and thin, and background, foreground. Lots of little, little things that make a great painting, and the same applies for writing, and the same applies for any language that you’re learning. There are lots of moving parts. The difference between a guitarist that just picks up a guitar and plays, and a person who’s learning from a teacher how to draw cartoons or write, is that they are running into mistakes, and those mistakes are being picked up very quickly and fixed. Yes, the 10,000 hours work, but it don’t work when the mistakes can't be picked up very quickly and fixed. This is the reason why pilots don’t crash planes every day. It’s because they sit in a simulator, and the simulator picks up those mistakes, and it enables them to fix those mistakes. Yes, the 10,000 hours works, but only if you don’t know what mistakes you’re making. When you’re younger, there is no pressure to earn money, or win any competition, or do anything, so you’re allowed to make those mistakes, and then fix them in your own time. This is why it takes 10,000 hours to get to that level of mastery. This brings us to the end of the first part, let's explore the second part which is, why does the flaw exist? Why don’t we pick up these mistakes? 2) The biggest reason why we don’t pick up the mistakes is very simple. As we grow up, we’re not supposed to make mistakes. We’re supposed to get things right. When you do a test, nobody says, “Hey, you have to get 30% of your test wrong.”You’re expected to get it all right. Once you have a situation where there is pressure to always get things right, then we have a real problem. People will routinely tell you, you should make mistakes to learn. But you’re not allowed to make mistakes, so it becomes a catch 22 situation. When we sit down to write a book, a report, an article, to draw or to learn Photoshop, we run into this situation where we are not making enough mistakes, and not being able to pick them up quickly, and therefore we are unable to fix them. This is what we do on the headline course. 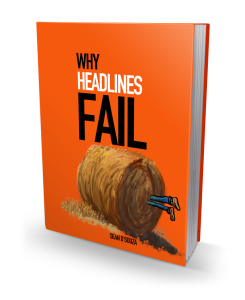 We have one week where you learn how to write headlines and another week where you write wrong headlines, and you would say, “What’s the big deal?” Why should you learn to write wrong headlines? It’s the same thing that pilots go through. They go through a simulator exercise where the plane is crashing. They have to learn to identify the mistake because mistakes are not apparent. The mistakes have to be highlighted. You have to run through the mistakes, and that’s when your speed increases. The reason why we struggle and think that everyone else is talented is because somehow, they’ve had time to get to those mistakes and fix those mistakes, and we don’t have that time.As we grow up, we have more responsibilities, more activity, and more things that we have to do. Getting straight to the mistakes and fixing those mistakes is what makes it powerful. If you look at talent as something that is inborn, you will struggle all your life because it means you can never have it; but if you look at talent as a reduction of errors or reduction of mistakes, then you realise that you just have to find the mistakes and eliminate them, or at least reduce them, and you have talent. The flaw exist in the system that doesn’t allow you to make mistakes, and this takes us to the third part of this episode which is how to get there quickly. The third is the group. If we start with the teacher, then the teacher must have a method, and that method should be about creating safety. If you’re intimidated, it is much harder to do anything because you’re scared all the time, so the teacher must be able to create a safe zone for you. Then the teacher must have the second element in place—The System. The system must take you through the training in tiny increments. When you teach your instruction have be in small moves— Like one inch today, one inch tomorrow. Very, very small moves. The reason is, supposing you were given a big move to make, say I said, “Move a few steps”. 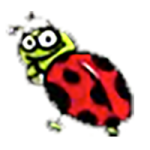 Well, you can move three steps left, three steps right, three steps forward or backward.Now, you have to come back three whole steps. Instead, if you make a very small move which is one step, you only have to move one step back, and this is not usually the case. If any of you have done a photography class, you know exactly what I mean. In that one class, they will talk about exposure, F-stops, aperture, and more. You’re completely confused. You’re not able to take one step, and so you go back to your auto-mode. Wait a second. Did you actually take one step at a time when you were teaching? Because even when you take a single step, you can be sure that at least a good section of your students have got it wrong, and now you have to bring them back.You have to bring them back to parity, and then take them one step forward. Training is not built by these tiny little increments. Books are not written with these tiny increments. There’s chapter after chapter, after chapter. Of course, we get lost, and so then we think we’re not talented where in fact, the system is at fault. There aren’t enough opportunities to make the mistake, for the mistake to be detected, and then for you to rectify that mistake. The reason why a group setting is so powerful is because the traditional way of testing someone is really bad. Remember when you were in school, when everyone did their test, and you got some things wrong, and somebody else got some things wrong; but eventually, nobody got to see what the other person got wrong. You’d do your assignment, and you’d hand it to the teacher, and she’d mark it and give it back to you. Only you could see what you got wrong; but if the entire group could see what you got wrong, they could learn from your mistake and you could learn from their mistakes.This is the fundamental flaw in most training. When you see other people’s work, you can learn from their work. It seems quite obvious when someone tells you that you could learn from other people, but that’s not how the system is built, and this is why it takes 10,000 hours to reach anywhere or 10,000 hours to reach that level of mastery. People are not stupid. People are very, very intelligent. People have the ability to acquire talent. People have the ability to reduce their errors; but often, it’s the teacher, the system, and the group, or the lack of group that lets them down.If you believe that someone else is more talented than you at cooking, at drawing, at painting, at writing, the reason is you haven’t figured out the mistakes and removed them. Once you do that, you have talent. The first thing we covered was the whole concept of the 10,000 hours, and was it true? We found out yes, it is true. It takes a long time because we don’t know the mistakes. If we don’t know the mistakes, then we make them, and we don’t realise we’re making those mistakes. The second thing we covered was that people tell you to make mistakes, but no one gives you the chance to make the mistakes. The third part we covered was you have to have a teacher, a system and a group. When you have these three elements, the teacher will work out the tiny increments and move you forward. The system will be not just how to, but how not to. ​​​​​​​Finally, the group will expose the errors of another 20 people; so now, you’re able to look at 20 errors, and at least learn from them, and possibly not make those errors in the future. The exposure to errors, that is the critical part of talent. Talent is simply a reduction of errors. P.S. If you’ve ever been stuck because you don’t know how to battle resistance, there’s this really cool report, and it’s free—How to Win the Resistance Game.